We really appreciate everyone being a part of this group and I thought it would be fun to do something to give back to you! Our November Challenge will have weekly giveaways as our way to say Thank You for all of your support. I think this will be a fun way to inspire, motivate and support each other. Make sure you’re a member of our Women Who Define Group to participate in the challenge! Overview: Each week you will be in the running to earn points. Keep track of your points daily and if spot verification is needed, you will be able to provide it. I’ve created a spreadsheet to help you keep track each week. Please note, we are here to have fun so we are running this on the honor system. We expect everyone to be in this for the fun of the challenge. The first week kicks off Monday, October 31st (so we can have a full week to start)! Also, to have your posts count, they need to have meaning. Meaning…. if you are posting a photo or writing something that took no thought or you posted “just for the point” then it doesn’t count. Tell us something about your workout, an NSV, your meal, what being healthy or fit does for you, what motivated you to try something new etc. Think about if YOU would find the post interesting and relevant in your “scrapbook” when you look back to see how far you have come? 1 points – For posting a meal with photo or video IN this group (up to 2 posts per week for a total of 2 points max per week) MUST be a clean or healthy meal, not just any meal you ate. 1 points – For posting inspiration or motivation IN this group. This could be a quote or a thought, something that means something to you that you want to share for mindfulness (up to 3 posts per week for a total of 3 points max per week). 3 points – post a non-scale victory (NSV) to share with the group. Examples could be you tried a new exercise class, added 5 min to your walk, cooked your first healthy dinner that everyone loved, one full day of clean eating, didn’t talk negatively to yourself for one day, made it longer in your workout than before, completed your first 5k etc. Just something that you’re excited to share that is new or is a win to you, no matter how big or small (up to 2 posts per week for a total of 6 points max per week). Points must be broken down by each day, the type of post it is and the bonus points clearly stated. Please include a TOTAL at the bottom of email. I have included an excel spreadsheet to keep track of your points to help you. All direct links must be to posts that are PUBLIC so we can verify. We want to keep this simple and fun. How you choose to track your points is up to you, you just need to be able to back up your points if necessary. Winners: The top THREE point earners each week will be put into a pool and ONE name will be drawn for that week’s prize! Giveaways will vary from week to week from Gift Cards, Accessories and items from the Katie K Active Collection. Giveaways cannot be returned or exchanged. Each new week starts EVERY MONDAY! 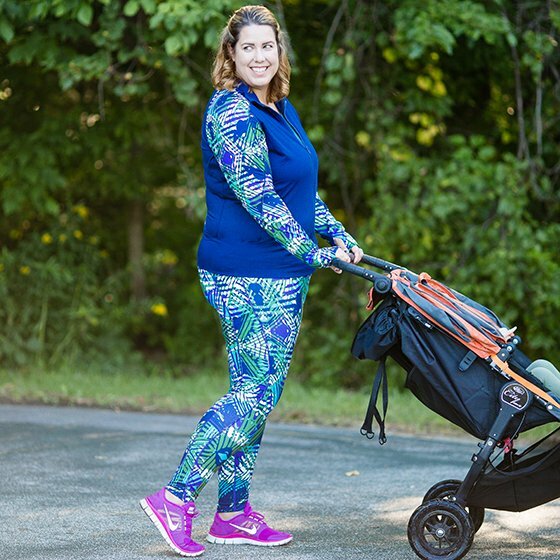 Katie K Active featured on The Daily Mom! We were thrilled when Megan from The Daily Mom connected with us about this article! We love the idea of activewear as a part of your daily life and YES, we agree it makes you feel great and put together with the fun prints and colors of the Palm Print Collection! 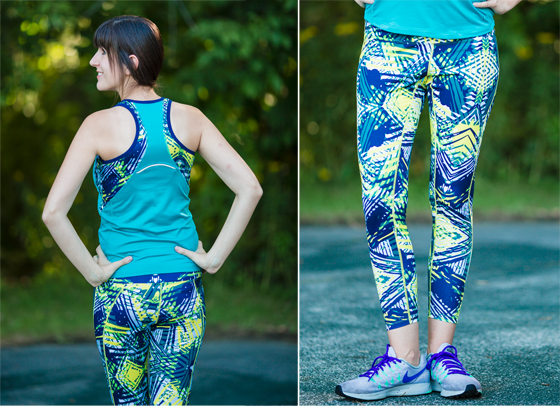 The Palm Print Collection is our favorite set for fall, because of its layering ability and super-cool print. 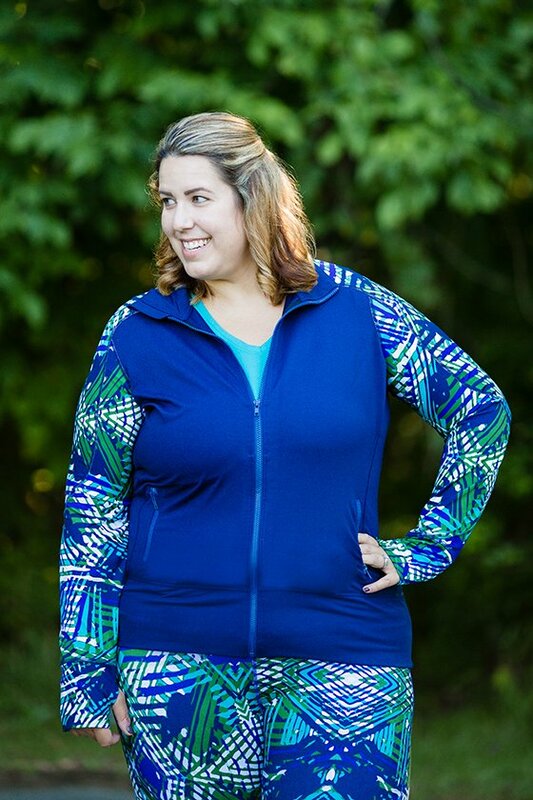 The Rushhour Jacket comes in the Navy with Violet Palm Print, and is the perfect match with the Rushhour Leggings in Violet Palm and the Aqua Colored Rushhour Tunic Tee. All of the material used is extremely moisture wicking, with UV 50+ protection. There are also reflective heat transfers for safety and road running protection. We adore the jacket’s discreet thumb hole seams. There is also a back yoke that is mesh-lined for cooling, as well as mesh pockets for breathability. The tunic is super-soft and comfortable and is great to layer underneath the jacket. 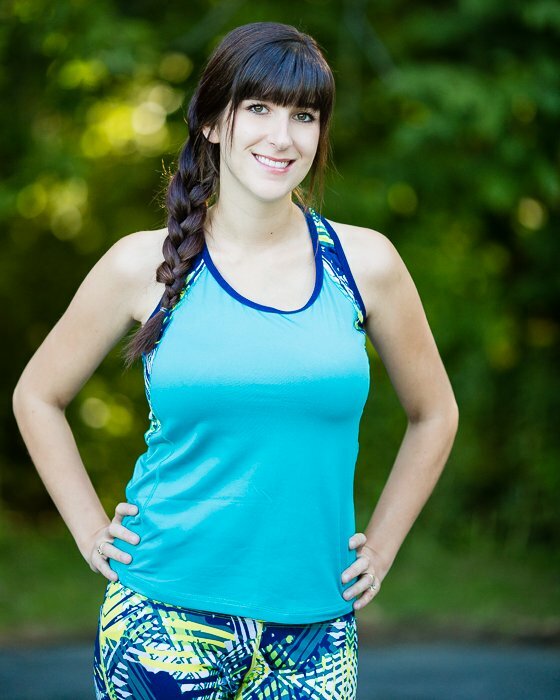 The RushHour Racerback Tank looks stylish and is supportive and comfortable, and we love the Aqua and Citrus Palm Print because it goes perfectly with the coordinating color Rushhour Legging. All of the leggings from Katie K Active feature a contoured, compression side panel, which makes them attractive on any body style. We also love the slimming, high-rise waistband and the discreet right side pocket. The black colored Rushhour Jacket looks great with the Citrus Palm Print, and we love how it’s neutral so you can pair it with your other wardrobe staples, or keep it in your car for an unexpected chilly fall day.